[WSO2Con EU 2018] Will Your Agile Practices be the Death of Architecture? Will Your Agile Practices be the Death of Architecture? I bet you can guess what my answer will be since I am in charge of Enterprise Architecture. I am a strong believer in the merits of architecture. But I also lead the modernization of our engineering practices. I will share with you some of the lessons we learned and the changes we made so that our agile practices were not the death of architecture. Jennifer Lim leads the enterprise architecture team at Cerner Corporation, a company focused on creating intelligent solutions for the healthcare industry. Enterprise architecture (EA) is committed to driving business value by maximizing technology investments, optimizing business capabilities, and managing risks, ultimately accelerating Cerner’s vision and business outcomes in areas such as data management and governance, data architecture, API life cycle management, engineering practices, user experience, and workforce collaboration. Jennifer has over 18 years of experience in the telecommunications, banking and federal, and healthcare IT industries. 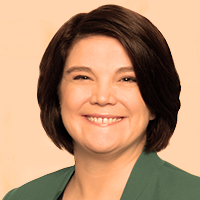 She has led both IT and business teams across a variety of functional areas, including data management, finance analytics, marketing, research analytics, IT architecture, and application development. Jennifer holds a BS in management information systems and an MBA in management.